Throughout my career, one thing has remained constant. My mentors are the ones who push my growth ahead. They ask questions that make me think both inward and bigger than myself. They kick open doors (sometimes literally) to create new opportunities and form new connections. They lead by example and elevate those around them. They are human beings like you and me. In today’s world, I believe we need more mentorships. We need people to challenge us to be our best selves, and support us when times get tough. Now, I feel it’s time for me to start giving back. To find mentees I can question, support, and help on their own growth journey. All of March, which is also International Women’s Month, I’m offering free mentor sessions through GrowthMentor. If you’re looking for a woman mentor, you just found her. Schedule your time here. Every company’s situation is different and each team will need to try new ways to improve their own company’s growth mindset, culture, team, and process. There is no one-size fits all when it comes to sustainably growing a business. With that being said, there are pioneers in modern-day growth that have experienced, tested, and gained learnings into what works well that they’re more than happy to share. It’s up to organizations getting started with a cross-functional, data-driven approach to growth to lean into these learnings for guidance. Running a marathon isn’t easy. And neither is growth. 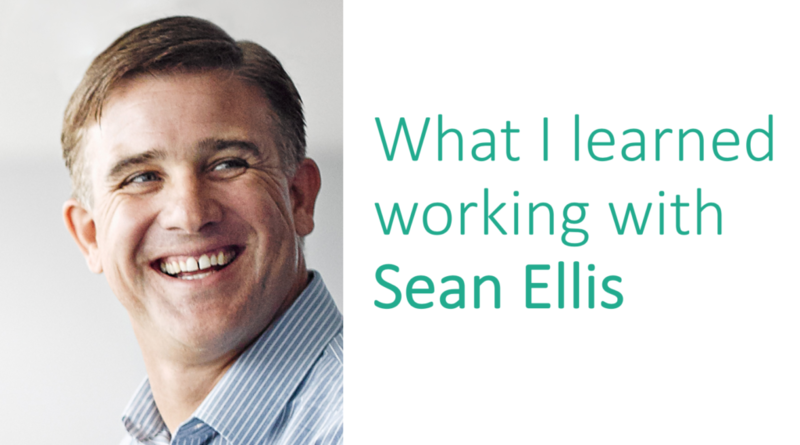 Over 2 years ago I sat down to coffee with Sean Ellis. I was anxious. I wasn’t sure what Sean would be like and I was in the midst of overcoming my own imposter syndrome as a marketer in the tech world. My nerves forced me to respond with my gut reaction, something that after 2+ years if working together Sean knows to be a rare occasion. I like to think through things before giving my two cents. “Without getting people to see the value of your product, they won’t come back which will make retention, referral and revenue near impossible. And while I have created and launched plenty of acquisition campaigns, I know that getting users or donors to the website is the easy part. Getting donors to donate money, getting users to actually use the product, or getting applicants to finish their application is much more challenging. I left coffee that morning thinking, wow, I’m not crazy! I found someone that sees marketing the way I do… marketing that experiments throughout the full customer journey. Marketing that looks across departments to find solutions to the biggest problems for long-term sustainable growth of the business. What I had been working so hard to do, without much permission in previous silo’d roles. Before I knew it I was joining the GrowthHackers team in a role that continuously evolved, as expected in a small startup. During my time at GrowthHackers, we planned two GrowthHackers Conferences, launched Hacking Growth, grew a community of growth pioneers, hosted hundreds of AMAs with leading marketing & growth experts, created a Growth Master training program, facilitated one-day growth jumpstarts for companies embracing the new way of approaching growth, and launched a software to make managing an experimentation process easier for teams. I learned SO much about marketing, growth, software, e-commerce, startups, enterprises, and myself. But it wouldn’t have been possible if it wasn’t for Sean Ellis providing a safety zone to take on this style of working… learning while doing. Now as I transition away from my full-time role at GrowthHackers, I want to share the most impactful lessons Sean has taught me during my time at GrowthHackers. My hope that you can also find a way to incorporate something new into the way you work. 1. Life is too short to work with a$$holes. There were times where we had to turn away potential partners, customers, and sponsors. One time in particular I had gotten pretty far down the planning process with one partner and they started demanding things that were out of our initial conversations, pigeon-holing me into saying yes, or having nothing at all. The initial sense of collaboration quickly turned into bullying. During this time, Sean’s words of wisdom really stuck with me when he said “Hey Dani, life’s too short to work with a$$holes.” Sean had his team’s back 100% and actively chose to stop working with the wrong people. Takeaway: Surround yourself with nice people. Everyone from your team, board members, clients, friends, and even soccer team. Be quick and polite to end any engagement where someone isn’t playing nice. Again, life’s too short to work with a$$holes. Sean has made his career one big learning experiment and so do I now. Looking at every failure as an opportunity to learn and every win as a way to open more doors. Fostering this type of learning environment for the entire team, as Sean did at GrowthHackers, is extremely important for leaders to keep top of mind. There were countless times where we didn’t know how to do something, but one of us would learn it and then teach the rest of the team. In our weekly growth meeting, we reserved a time to discuss what we learned the week prior, and everyone was encouraged to participate. This type of collaborative learning environment allowed us to move fast and learn together as a team. Takeaway: Start a collaborative learning environment today. Ask your team a simple question, “what have you learned lately?” This question sparks good dialogue (although a little awkward the first time you ask it) and exposes otherwise unnoticed intel about the business. 3. Focus on the positives. Sean developed the Product Market Fit survey and focused on the people that would be “Very Disappointed” if the product went away instead of focusing on the people that wouldn’t be disappointed. 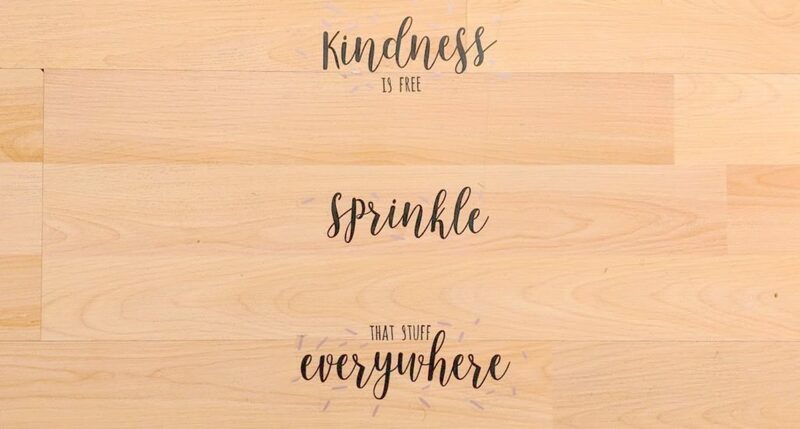 By focusing on the positive, you can do many things. You can find people that are passionate about your product and understand why they love your product, which is often times completely different than why you think they love your product. You can understand what channels they came from and reinvest in those channels. And you can also understand how these passionate people position your product so that you can find more people like them in your marketing. Sure, focusing on the negatives can be helpful at times. You want to know if there are glaring holes in your product. But if you always focus on the negatives, instead of investing in what is working, you may begin building your product for the wrong un-interested people. Plus, focusing on negatives or focusing on how much better your competition does something will certainly make your startup journey much more depressing. Takeaway: Start talking to your most passionate users and continue to provide more value to them instead of focusing on the competition. 4. If you have a good employee, tell them. I’m self honest and could take on learning challenges to get better at something I knew I wasn’t good at doing. I’m good at reading situations and knowing when it was okay to joke around and when it was time to get to business. I’m good at speaking up and ensuring my voice is heard, acknowledged, and then could move on with the big picture goal. I’m self-sufficient with a bias toward action. I waited for the compliment sandwich with meaty negative feedback to be served, but it never was. Sean told me he enjoyed working with me and had nothing negative to share. While this type of feedback is quite different than what people are used to, it reminds them of the value they bring to the team. You never know when someone is doubting themselves or their work and this type of feedback can go a long way in building trust and confidence. If there was something that could have been handled better, Sean and I would discuss it right away. He’d grab me for a quick walk or sit in our “Idea Lounge” and give suggestions for how it may be handled better the next time around. I always had the opportunity to speak my mind and share why I did something the way I did and we’d just have a conversation about it. Then back to work. The real-time feedback is crucial for employees because it allows them to make mistakes as long as you can learn from them. There will never be the looming “Oh no, I wonder what my boss/peer thinks of me.” Your team’s confidence and trust will rise, making work a lot easier. Takeaway: Let your team know that you want to start giving real-time feedback so that you don’t catch anyone off-guard and start giving real-time feedback when issues arise. Don’t let an issue go longer than 48 hours without discussing it with them directly. Sean is the first to recognize if someone else’s idea worked. Countless times Sean received praise and immediately deflected it to someone else on our team or someone else he learned from. By remaining humble and giving credit where it’s due, you will become more trustworthy and help to boost the reputation of those around you. Takeaway: Acknowledge your team’s work. Did they launch a new campaign successfully? Have metrics improved? Figure out which team members are responsible for the positive results and praise them publicly. 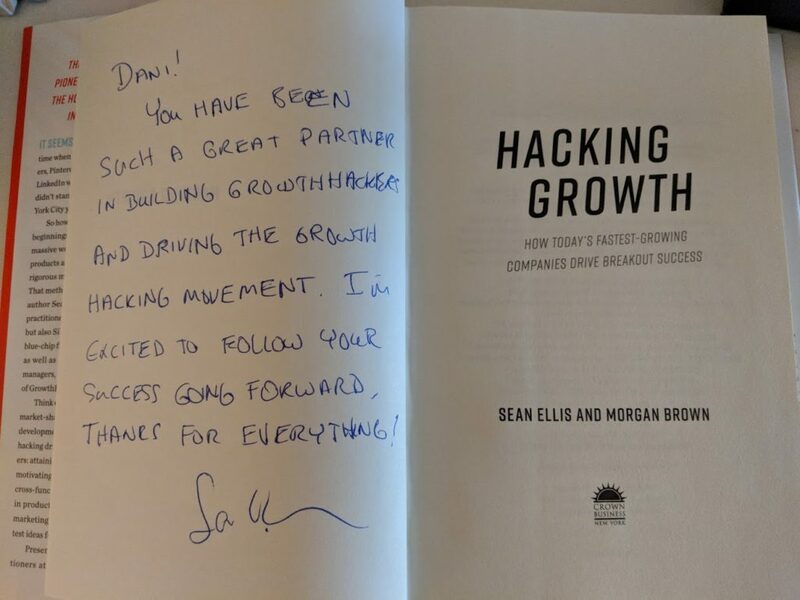 And in the essence of giving credit where it’s due, I’d like to end this post by sharing how grateful I am for having the opportunity to work alongside Sean and the GrowthHackers team the past couple of years. If it weren’t for Sean and the team, I wouldn’t be as confident, thirsty for learning, or in the company of an amazing growth network that exists today. Thank you for everything, Sean. Sign up for my email updates and I’ll teach you what I learn along my journey. Think your marketing efforts are ahead of the curve? Think again. Innovative Formats & Integrated Campaigns – Back by Popular Demand & Here to Stay! Moved to California, worked remote, and eventually transitioned into marketing at Payoff, a fintech startup. I started writing again when I started working with Sean Ellis at GrowthHackers. Want to learn from top experts in growth? On this International Women’s Day, I want to recognize 10 of most impactful women in my life that have helped shaped me into the person I am today. My mom for raising my brothers and I to treat others with respect, teaching us to look for the good or what you can learn in every situation, demonstrating gratitude, embracing change, challenging us to be our best selves – no matter what that looks like, and countless other lessons. Paula for pushing me to recognize & embrace my strengths & what makes me different, teaching me that sometimes you need to just march in the Dean’s office and speak up for what you believe in, and that faking it ’til you make it is one of the best ways to continuously learn & push yourself. Elise for championing me in my first “real” career job, showing me how to understand & connect with others, and teaching me how to maintain, rather than burn, bridges… because you never know which ones you’ll want to cross later. My Aunt Lynne, an interior designer, for teaching me what it means to be welcoming and a great host, allowing me to appreciate the little things, and demonstrating what grace and poise looks like in every scenario – even with a broken arm & ankle. My second mom, Linda, for welcoming our family & teaching me that family is what you make it, showing me that animals have feelings too, and demonstrating what hard work & passion looks like as a business owner. Debbie for showing me how to persevere even when things aren’t going as they should, demonstrating how to lead a healthy family & work team, and teaching me how to mentally train for & run my first marathon (which has taught me countless other things). Our neighborhood mom, Susan, for teaching me what community should look like, making our family countless meals (I still think about your mac & cheese), and welcoming us Hart kids like your own. Sara for sharing that passion for other people’s success can fuel your own success, how to lead in a world of followers, and for instilling the importance of diversity in the people you surround yourself with. Bekah for teaching me what kindness and compassion looks like, and for helping me realize that no matter how long it’s been, a true friend will be there for you.
. Thinking about what I’ve learned from each of you, and countless others not mentioned here, puts a smile on my face (just like the one in this photo). What women have impacted your life? Please don’t be afraid to tell them today, or any day.